If you’ve taken a look at the old blog in the last day or so, you’ll know that I’m closing up shop at the end of the month. The long and boring explanation is over there; the short and snappy one is here: It’s been a decade since I started writing out my Linux experiences there, and two and a half years of chasing down console software here — a lot more than I anticipated on either side. For today, I have ddir to show. It’s not terribly beautiful, but I think you will see its usefulness. I’ve known about ddir for a while, but to be honest, whenever I’ve needed something like ddir, I just grabbed tree (which I see now is listed nowhere on this site. 😡 ) They are very similar, as I’m sure you’ll admit. And given that ddir seems to only offer ASCII characters as output, tree offers a small visual improvement. True, it’s the difference between 1982 and 1983 in console graphics, but it’s there. ddir’s “help” flag will spit out its man page if you ask, and its few options are there for your perusal. Probably of most interest is the -d flag, which will prune the output (get it? prune? tree? ) to directories only. ddir is a basic tool and probably something an introductory-level CS student could replicate on a Saturday night as a party trick, but you can probably see a few uses for it. 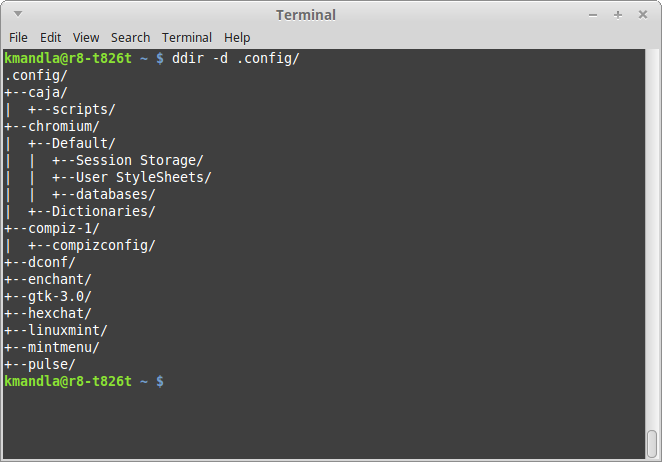 It’s in Debian as just “ddir,” but I don’t see it anywhere in Arch. This entry was posted in Linux and tagged directory, structure, tree on 2015/04/12 by K.Mandla. So you are also closing this site too? Are you abandoning the console, and moving to GUI-only apps? Yes, I’m going to step away from this entirely. I’ll lock up both sites, and turn off commenting just to stop spam. You gave several arguments in your other site that make sense (except for one thing that I’m going to comment there) about closing THAT site. But they really don’t apply to THIS site. Even if you got bored of doing one app-a-day, and the concept of “old computer” has changed, that doesn’t really count as a reason to stop using console apps. But don’t take me wrong, this ones are your sites, and your life is yours. And well, I have to say that I had a good time reading! sad to see it go, thanks for your work and best of luck. I enjoyed reading this blog. Thanks for your work on it. Thanks. I’ve found so many great utilities through this blog, you’ve sent me to AUR more times than I can count. Thanks for all the reviews. Very usefull. Pitty to see you go, but I can imagine it’s a lot of work to keep things like this going.